In this book, you are going to discover 20 different patterns for baskets, lap throws, and dishcloths. Little items that you don’t notice outright, but when you place them around your home, you see just how incredible they are. They add character, they bring in their own level of charm, and the show the world what your tastes are. I want to help you make that happen in your home, which is why I have put together this book. I know you’ll love the patterns, and you will love what they do to your home even more. So go ahead and release your inner interior designer. It is really amazing to craft your own jewelry with the help of crochet yarn, beads, and various other things. If you learn the basic crochet stitches, you can start working on these projects. It will be really motivating and pleasing to design your own jewelry. This book is designed for your assistance to get unique bracelets, rings, and necklace. It will be a good start for you to commence your own business. If you have leisure time, this book will be a great choice for you to spend a good time. If you would like to wear some unique and distinctive crochet jewelry, the 15 patterns would be great for you. Design matching necklace, rings, earrings and bracelets of your choice. Feel free to modify these patterns and change colors as per your needs. These patterns are easy to follow and you can complete this work in a short period of time. The book “Crochet placemats” have been designed to make you learn about different crochet patterns for placemats. You will also learn how different types of napkin rings are crocheted. Here, you are going to learn 15 elegant and beautiful patterns for making placemats and napkin rings with the help of crochet. All the steps which have been given in the book are written in simple language so that you can easily comprehend that. So, if you are interested in learning all the patterns of crocheting placemats then download this book now. Crochet bags are essential to carry your routine items and with the help of this book, you can design beautiful bags. This book has 10 crochet patterns that are easy to try with basic knowledge of stitches. You should learn single crochet, double crochet, half double crochet and treble crochet. These stitches will help you to design various bags. You can change the colors and threads, modify these designs and feel free to give your own touch to the design. You should learn foundation chain and slip stitches. This book has a few innovative bags that are unique and beautiful for you to try. These bags can be designed in different colors and your innovation can make these bags really creative. You can add flower, butterfly, ribbon bows and various other things to these bags. These bags are equally good for casual and formal events. You should update your collection and save money by crocheting these bags. Download this book and get the advantage of 10 patterns of crochet bags. These patterns are really unique and beautiful for everyone to try. You can send these bags as gift to your family members. Download your E book “Summer Crochet Book Collection” by scrolling up and clicking “Buy Now with 1-Click” button! 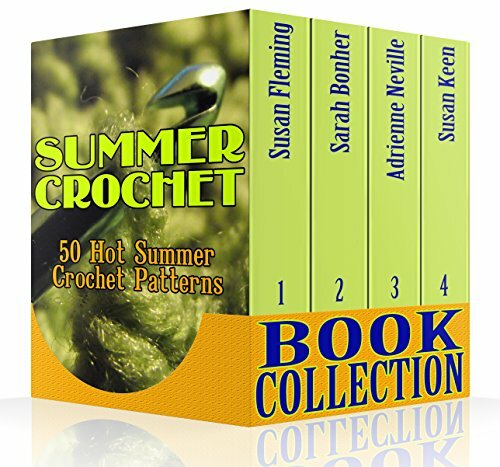 This is the Kindle version of Summer Crochet Book Collection: 50 Hot Summer Crochet Patterns: (Crochet Accessories, Crochet Patterns) that you can also download and read on your computer and mobile phone. Kindle books are DRM protected and therefore, unlike ebooks that are in PDF or ePUB format, you cannot read this ebook without the official Kindle apps.